While giving his speech at the opening of the exposition ‘Distance’, initiated by the Dutch Helsinki Committee, Chair of UEL, Mr. Tiny Kox (SP.NL, The Netherlands) recalled his contentment with the release of Ilgar Mammadov. Mr. Ilgar Mammadov, leader of the opposition civic movement ReAl in Azerbaijan, who had served more than five years in prison and whose arrest and prosecution had been politically motivated, was ordered by the judgments of the European Court of Human Rights to be released. 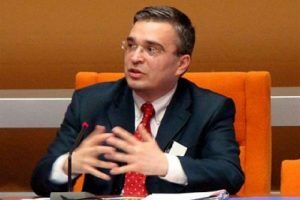 “According to our Strasbourg Court, Ilgar Mammadov had been sentenced on false grounds and therefore wrongly imprisoned. But it lasted until few weeks ago that the Azerbaijani government finally gave in and released Mr Mammadov” said Mr. Kox. This result, according to the UEL chair, “could have been reached after the Council of Europe first had to use its strongest weapon: the threat to exclude Azerbaijan from the Organisation, and therewith from the civilised Europe it had become part of, 18 years before”. The chairman of UEL also mentioned that the results of the investigation by the external investigation body of which Mr. Kox has been an initiator and which uncovered undue influence and corruption by a network of supporters of the Azerbaijani government in the Parliamentary Assembly, reaffirmed the “determination not to accept any illegal pressure by any government when taking our decisions”. Even if Mr. Mammadov is still in danger of being put back in his cell, as the verdict as such has not yet been revoked, and is unable to leave Azerbaijan, the UEL Group is satisfied that Azerbaijan complied with the decision of the Strasbourg Court and “that the decision of the Committee of Ministers of the Council of Europe not to accept any longer Azerbaijani refusal to execute a binding verdict of our Court of human rights, finally made president Aliyev and his government to give in, at least in this case” acknowledged Mr. Kox.